a. Does the judicial appointments process secure an independent judiciary? b. 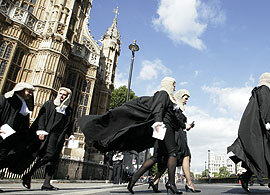 Should Parliament scrutinise judicial appointments? c. How can public understanding of the appointments process be improved? d. Is the system based on merit? e. Do we have a sufficiently diverse judiciary? The Committee has heard evidence from an impressive roster of public figures, including Lord Phillips, Lord Judge, Lady Hale and Lady Neuberger. Yesterday it was the turn of Lord Neuberger and Lady Justice Hallett, neither of whom pulled any punches in their assessment of the current judicial appointments process and diversity of the judiciary. Lady Justice Hallett suggested that it was the workload that put off many women from either applying to, or staying at the bench. The normal pace of work for senior judges was now “frenetic” leading to “Women voting with their feet and saying life is too short. [They say] ‘We are working too many hours in the day and we forget the importance of family life’.” The result is that the UK is now lagging behind other countries in terms of the number of judges who are women or from ethnic minorities. As ever, while it may be relatively straightforward to pinpoint the problems, solutions are more difficult. Neuberger is in favour of encouraging more solicitors to apply to the bench and encouraging the solicitors firms to see having partners sitting on the bench as a mark of prestige, as barristers chambers currently do. Neuberger also suggested that s 159 of the Equality Act should be used to give priority to women and other underrepresented groups if there are otherwise two equal candidates for a judicial post. However, this suggestion may well be met with accusations of tokenism. The Committee continues to gather evidence and will be hearing from the chair of the Black Solicitors Network, a representative of the Association of Women Barristers and the chairwomen of the Association of Women Solicitors next week. It is unclear when the final inquiry report will come out, but when it does it will be interesting to see how the committee approaches the various solutions with which they have been presented. Leave a reply on "It is a truth universally acknowledged …"